You may have noticed the black square thing to the left of the square. That’s a camera, used for rendering. 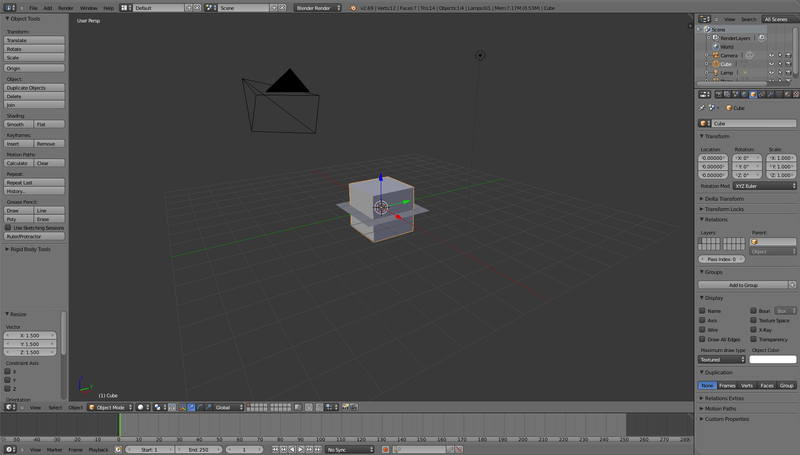 This time, let’s look at the process of making something in Blender! First things first, let’s boot Blender up and have a look at the basic GUI that we’re presented with. One thing you’ll notice is how… Empty… It looks. The large area is just a square all by itself. How sad for that square. Let’s work to make the Holy Symbol for our game! We’re going to begin with that little square and it’s going to help us by becoming a whole new object. 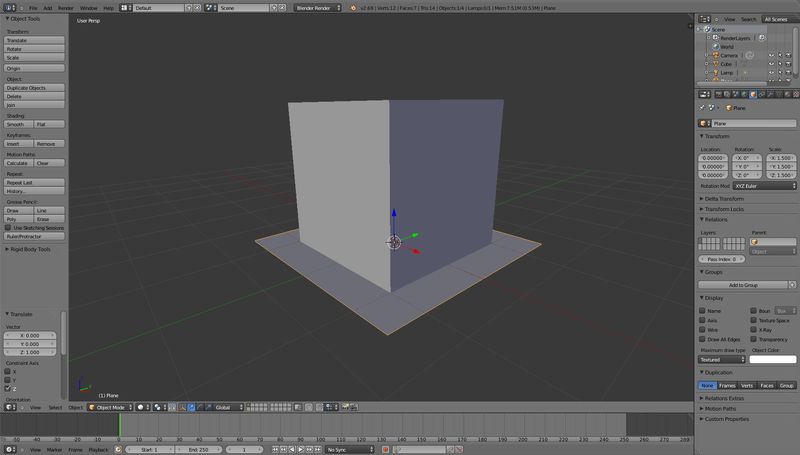 When you press the space bar in Blender, depending what you’re focused on, you can get a menu to appear. Make sure your cursor is in the main design part of the application, press space and then type “Add Plane” or just “Add p” and it should appear. Next press S and type 1.5. 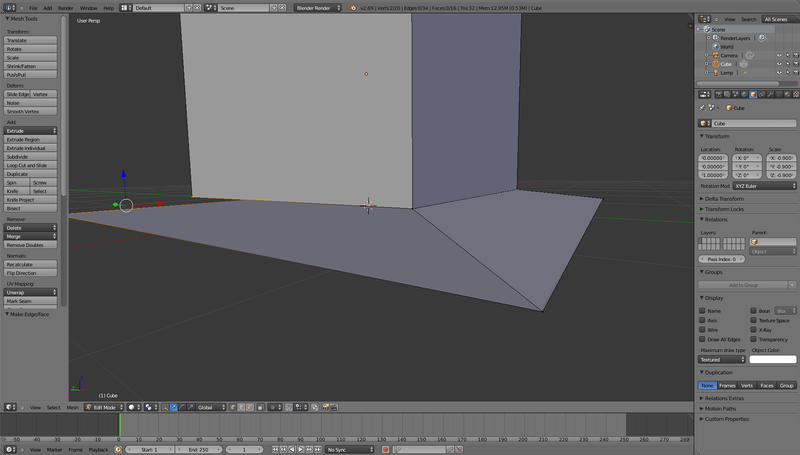 By doing this, we’re telling Blender to scale the object to 1.5 times its current size. I know that the Plane would start at the same size as the cube, so by multiplying its size by 1.5, it’s going to be bigger, big enough for a base. Okay, so that’s all well and good but this is still just a cube on top of a piece of cardboard… Kind of. What can we do with this? First of all, let’s begin shaping this object some more. I’m going to select the cube, press S then type “-.9” Exactly like that. This scales the object down to 0.9 of its original size. From here, we’re going to begin to shape this object. Press the tab button with the cube still selected and suddenly the whole thing becomes orange. If we press tab again, we go back to the orange outlines. So what’s this all about? The tab toggles what mode you’re in: Object and Mesh. Back in Object mode, press down shift and right click on the plane. It selects both the plane and the cube and on the left hand side, we’ll click “Join” It is now one object! 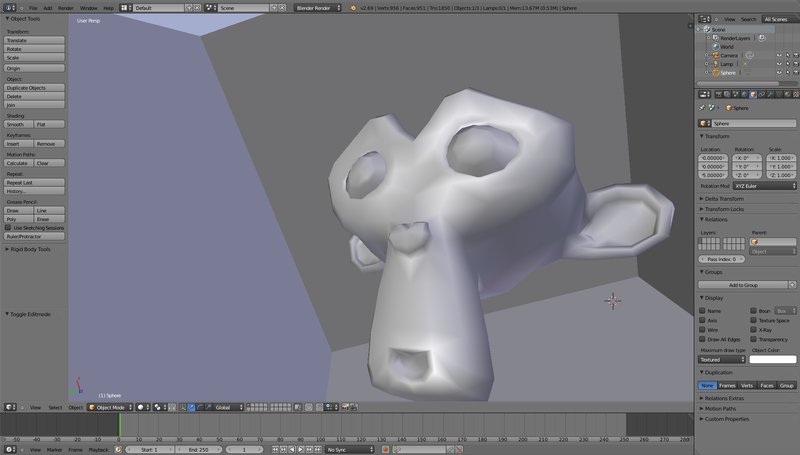 Now we’ll toggle back into Mesh and we’re going to join the two meshes so it really is one object. We’ll select two points of the mesh. We can really select wherever we want with this, but we’re going to select one of the points on the plane and one of the bottom points of the cube. We’ll press F, then we’ll do it on another two points, following this around. We should end up with 4 lines, joining the meshes together. Select 4 points, which are contained within the lines and then press F again. You’ll end up with a face, like the below. 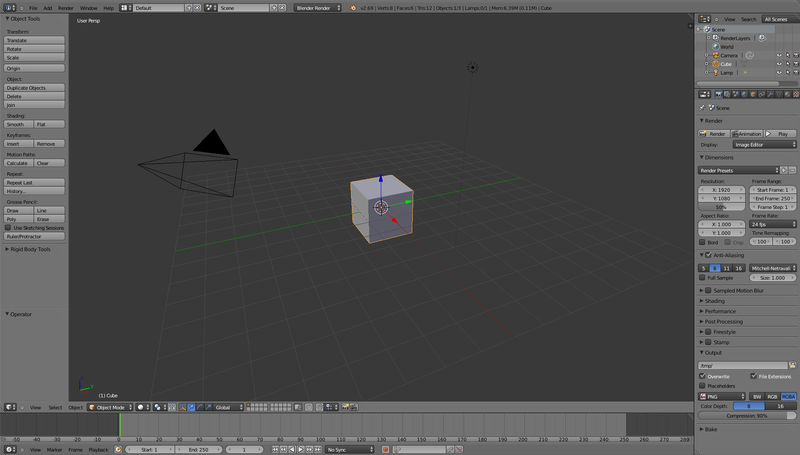 Doing this for all four corners, we can now manipulate our object further until we eventually get a final product. After a lot of playing around, I thought I’d make the symbol relatively simple. 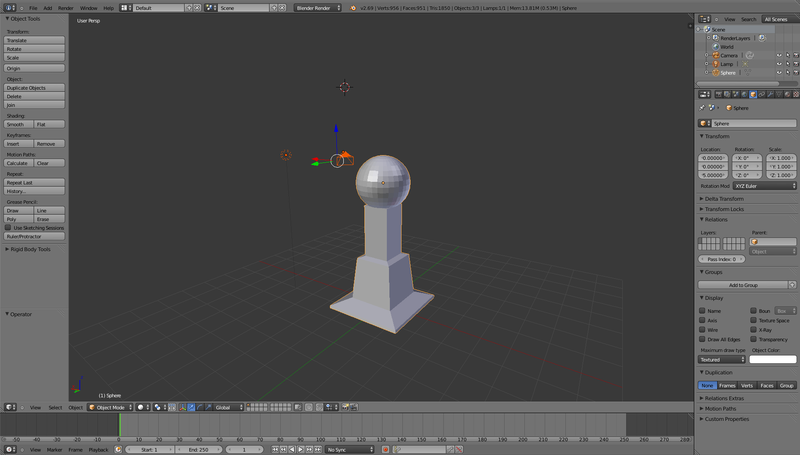 An orb on top of a podium of kinds, nothing too fancy and quite easy to distinguish from other objects that will be in the game. I ended up with the result below. Okay, with this post done, I’m going to have to get on with making a lot of 3D models to add into the game. If there’s an object you’d like to see in the game, let me know in the comments below. If you’ve found this post insightful as to how to use Blender in any way, please give me a like and a comment – Let me know if these posts are interesting or not. I’ll try to make as many of the objects you guys suggest in the comments. As always, comment below, over on Facebook or on Twitter. This entry was posted on May 3, 2015 by Timlah. 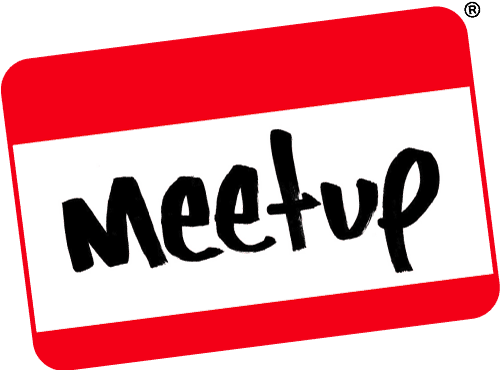 It was filed under GeekOut discussion and was tagged with 3D, 3D Modelling, Blender, Game Design With Timlah, Geek, Linux, Mac, Modelling, Search Within, Software, Symbol of The Faith, The Faith, Timlah, Tutorial, Ubuntu, Windows.